We’d love your help. Let us know what’s wrong with this preview of The Songs in Our Hearts by Chantal Gadoury. But Charlie's been burned before with her first crush, at the hands of an ex-friend and a cruel joke. Because of those scars, Charlie keeps her guard up when High school junior Charlie Blake has never seen anyone quite like Micah Jacobs in her small town of Grand Lakes. With his carefree spirit, rough-around-the-edges personality, and handsome grin, Charlie is transfixed. To ask other readers questions about The Songs in Our Hearts, please sign up. "The people that really matter are the ones who don't gossip about you, the ones who know the truth." 'The Songs in our Hearts' is a young adult contemporary romance novel with Charlie as the main character. She's had a bad experience with a mean girl at school before who was supposed to be her friend. So when that girl tells everyone that Charlie has a crush on Micah, who has just moved back to her town, she is afraid that she has to relive her past. Getting teamed up with him for a school project just makes it even more difficult for her. I absolutely adored this book. It was such a sweet story that was so different from any other I've read before and I couldn't get enough of it. I smiled a lot while reading because it made me so happy. It's a really quick and easy read with a super sweet ending and the important message to stop worrying about what other people think and to start living. I really loved the characters, especially Charlie because I identified a lot with her. In some ways we're quite similar. - She cares too much about what other people think of her. So did I back in school. I still do sometimes, but it's a lot better now. to punch someone in the face. Because I will." Isn't that sweet? I absolutely loved Micah too. He's so dreamy 😍 I want my own Micah 🙊 Charlie and Micah's relationship felt so real and natural. Like it could really happen or did happen and I really appreciated that. The book has a really cool feel to it. There are text conversations which I found hilarious sometimes and even parts of the screenplay the characters are working on. Music plays a big role in this book and I loved that there is a song title and the artist's name at the beginning of each chapter. I think they are meant to be the soundtrack for that chapter and it was such a unique idea. I always listened to them before I read the next chapter which was a really cool experience. There were some old songs and some new ones, some songs that I knew and some that I didn't. This sweet story brought back memories of high school - especially the emotional intensity and insecurity that comes with a first crush. This is more than a romance, with a believable story about trust, mistakes, growing up, and (obviously!) music that readers can relate to in so many ways. Perfect for Kasie West fans. This sweet contemporary, high school romance both sweeps you away into the characters and makes you reminiscent of your own high school ways and adventures. The budding relationship explores the intricacies of high school romance with intertwined passion and insecurity on both sides. I just so see myself in these pages that I had so much fun reading it. I'm am relatively new to contemporary, but have really enjoyed everything I' Arc kindly provided by the author in exchange for an honest review. I'm am relatively new to contemporary, but have really enjoyed everything I've read so far, including this wonderful book. I finished the book in one day which made me appreciate the pacing in the novel. Never too slow and never too quick with no unexpected, unnecessary plot twists...I was so content to never stop reading. Thus, I think it is the perfect "Get out of a slump" book or the ever so needed "Help I have a book hangover" book. The most brilliant and unique aspect of this book is the chapter titles which are songs that relate to the material in that chapter!! I adored this! I also just really loved all of the pop culture and song references throughout. Some of my absolute favorite songs are mentioned (most importantly La Vie En Rose!!) within the book and I felt so happy. When I hit that last page, I didn't realize it was over. I had hoped for just a bit more of a collected ending, but it in no way hindered my heart from still loving the book! I 100% recommend this book! Read it, love it, and have some fun along the way! This review has been hidden because it contains spoilers. To view it, click here. I received a free copy of this book from the author in return for my honest review. This book had me smiling the whole way through. A tale of letting go of the events of your past to enjoy the future. I felt a deep connection with the main character Charlie and her internal struggle of coming to terms with how she feels and finally learning to stand up for herself. Being honest with ourselves is sometimes the hardest thing to do and through Charlie's journey I can honestly see parts of myself. A I received a free copy of this book from the author in return for my honest review. Thank you Chantal for sending me this eARC in exchange for an honest review! I'm a fan of contemporary romances and this book didn't desapointed me. I've finished this book in an instant. The story and characters were so compelling and funny. I truly felt sad when the book was over. Micah was my favorite character. He's so spontaneous and the one that always starts the talking, making the story li "The people that really matter are the ones who don't gossip about you, the ones who know the truth." Micah was my favorite character. He's so spontaneous and the one that always starts the talking, making the story lighter. On the other side, Charlie is more reserved and skeptical. I thought it was the perfect balance. I also loved the songs recomendations at the beginning of each chapter. There's just one thing that bothered me. The spoilers for the classic "Frankenstein". I haven't read it yet, but I can't complain. It's a well know classic and it's inevitable to get spoilers one day. However, it was really fun to see how the characters adapted it for their school project. This book brings an important message wich I enjoyed. Even when you think you can't trust anybody because of one mistake, you can't shut yourself down. There's always good people that truly cares about you. I highly recommend this if you enjoy a cute plot, music recommendations and a well created character development. What a sweet high school romance! It was impossible not to adore Micah, Charlie & company. This story was authentic, and made me reminisce. Also, Micah's charm was irresistible ... SO much love for him. Both main characters brought out the best in each other, and I could not stop smiling while reading this book. Their mutual passion for music, and meaning, was such an intriguing element to this read!! Chantal, thank you so much for sharing The Songs in Our Hearts with me, and so many others. It was such a pleasure! I cannot wait for Book #2. This book was kindly gifted to me by the author in exchange for an honest review. Honestly? I truly loved this book!! Chantal did such a great job telling the story of Charlie and Micah. One thing that I love is dialogue. I love to see characters interact, I love to follow the process of how two people I fall in love, I love when 2 people actually talk to each other. This book had so many likable characters and I enjoyed them all. I applaud Chantal is capturing all this in such a beautiful story! This book was kindly gifted to me by the author in exchange for an honest review. I hadn't read such a refreshing YA novel in a long, long time. I received a free digital copy of this book from the author in exchange for a review. I had no idea I was going to love it this much. This is one of those classic YAs that make you feel young and in love. I was literally smiling from ear to ear throughout the book. It was super light and cutesy and without any unnecessary plot twists. AND THE BUTTERFLIES OHMYGOD. Every chapter ha I LOVED THIS BOOK. Every chapter had a song as a heading and I loved the concept. I love how both the characters bonded over music and the chemistry they had. I could relate to Charlie on a spiritual level. "I lifted my slice of pizza, entranced by the aroma of cheese and pepperoni. Screw games. I was the stepsister in Ever After. I was there for the food - clearly"
"If I couldn't express my feeling, at least I could eat them"
She was always afraid of getting judged and afraid of breaking the rules but being with Micah brought out the inner sassy Charlie in her. Micah helped her becoming more than what she was used to being. Micah might come off as a jock at first, but like Charlie said, never judge an album by it's cover. I honestly love them both. I enjoyed every bit of this book. I'd recommend this to anyone in a heartbeat who's looking for a light classic YA. Also, this book is a great source for finding good music. REALLY GOOD MUSIC.
" I never expected any of this to happen, but I'm glad that it did." Well, I never expected to fall in love with this book, but I did. I received a digital copy of this book from the author in exchange for an honest review. Thank you Chantal for sending me an eARC. Charlie Blake doesn’t have a good experience with crushes for she was betrayed by her ex-best friend once. When she spots Micah Jacobs, the new kid in school, across the cafeteria and develops a crush on him, her worst nightmare comes true when that very same friend reveals it to the whole school. But things take a whole new turn for Charlie when Micah takes an interest on her, teasing her and befriending her. As a senior on the verge of graduating, this book made me smile so much. It was a flashback to all the memories I had in high school; having crushes and annoying best friends who won’t stop talking about it; stealing secret glances and smiling all day long because of a silly conversation; embarrassed when your crush finds the truth and then making a vow to never show your face again but failing and catching that mischievous and teasing glint in their eyes when you pass in the hallways. And when you actually get paired up in a project, eff the butterflies, there is a whole zoo running around in your stomach. This book was a summary of every teenager’s high school experience. The author captured a young adult’s mind so accurately that I knew for a fact that I would do the something if I had been in Charlie’s place. I thought it was kind of silly at times and got really frustrated with Micah and Charlie but then I realized, that’s actually our everyday lives. In fact, this book held a text conversation between Charlie and her best friend that I had with my very own best friend. Loved this book. ‘The songs in our heart’ reminded me how much fun it is to be a teenager. ➳ Arc kindly provided by the author, in exchange for an honest review. Chantal approached me to read one or more of her books in exchange for an honest review and I'm so glad she did! When I read the blurb for 'The Songs in Our Hearts' I was like 'This seems sweet. It actually sounds like something I would love. ', so of course I chose to read this and of course I had been right. This is a short book, I seriously powered through it in a couple of hours. I just couldn't put it down, it was such a fluid read and it could not have been sweeter. This book is the perfect read for when you're in a book slump or a book hangover and you just want a book to get you out of it and clean your palate, the kind of book that will leave you feeling good and warm. It has its share of drama, innocence and sweetness. Mostly it's a book about a love that takes you out of your shell / comfort zone and gives you confidence in yourself. You can't help but enjoy Micah and Charlie's love story! They both fight their true feelings for a long time afraid to ruin their still pretty uncertain friendship but with good advice from an annoying brother and all his friends, a sweet letter with an adjoint mix-tape is written that might just bring them together after all. What made the book even better for me was finding out that this book is based on real life events. Micah is real. It just makes me happy to know that guys like him exist, even if he changed when he grew up, his teen heart is immortalized in this book. And basically, from a shy girl, or woman, whatever I may be (I might be 21 but sometimes I still feel 16) I just hope my Micah is out there and that one day he'll find me and help me get out of my shell. Contemporary YA romance books are not really my cup of tea, but after a summer spent reading fantasy books, I quite welcomed and enjoyed this change of genre. The Songs in Our Hearts took me off-guard and while I can’t say I’ve had a change of heart about the genre and that I’m going to only read contemporary YA books in the future, I will definitely read everything Chantal Gadoury writes from now on. The writing style of the book is incredibly simple, yet beautiful, the story and the characters Contemporary YA romance books are not really my cup of tea, but after a summer spent reading fantasy books, I quite welcomed and enjoyed this change of genre. The Songs in Our Hearts took me off-guard and while I can’t say I’ve had a change of heart about the genre and that I’m going to only read contemporary YA books in the future, I will definitely read everything Chantal Gadoury writes from now on. The writing style of the book is incredibly simple, yet beautiful, the story and the characters completely relatable and the musical references give it a uniqueness that in my opinion puts it over the top in the contemporary YA romance genre game. The Songs in Our Hearts is a story about letting go of the past and opening up to new people, a story about growing up and finding love along the way. This is something, I believe, every one of us can relate to. We’ve all been there at one point or another, but it’s interesting to read about it and look at the situation from a new angle- from the outside in. The characters make silly decisions, there is miscommunication and mistrust- all things my teenage self has done, so while at times I got frustrated with both Charlie and Micah, I also realized that they’re behaving the same way I’ve behaved in similar situations. And there lays the author’s genious- she brilliantly captures the way that young adults think and act. That paired up with the incredibly up-to-date musical references (with mentions of artists like Demi Lovato, Shawn Mendes and The Chainsmokers, just to name a few of my favorites) make The Songs in Our Hearts one of the best contemporary YA romance books I’ve ever read. In addition to all the things I’ve already mentioned, I also really liked the relationship between Charlie and her brother Josh as well as Josh’s friends. I absolutely adore them! I need a whole separate book just about them and their shenanigans to be honest! Let me just say that I did not plan on having this book and review completed until Friday. Yet, here I am, finished with the book, after starting it just yesterday, and now writing my review. This book was just the cutest, most amazing YA contemporary that I have read this year. After I just finished reading Allerleirauh and now this one, I'm definitely going to be picking up any book that C I received this book from the author in return for an honest review. This in no way influences my opinion. Let me just say that I did not plan on having this book and review completed until Friday. Yet, here I am, finished with the book, after starting it just yesterday, and now writing my review. This book was just the cutest, most amazing YA contemporary that I have read this year. After I just finished reading Allerleirauh and now this one, I'm definitely going to be picking up any book that Chantal Gadoury releases. Her writing style makes me feel so connected to the characters and loving the characters more and more. This story follows a girl named Charlie who is a sixteen year-old in high school. Charlie has had a bad experience with a crush in the past, so when a cute boy named Micah wants to start talking and hanging out with her, she feels that she needs to keep her feelings bottled up in order to avoid getting hurt. But she gets paired with Micah to work on a project together and they spend lots of time together, forcing her to keep holding the truth back. Charlie continues to question if she should finally tell Micah her feelings, even though they both have made it clear that they are "just" friends. AHHHH, this story gave me all the feels. Starting this book out, I disliked Micah a lot. Sorry! He was just too pushy in my opinion. One scenario that I will mention, is when they go to a bonfire with his friends. Charlie is very uncomfortable being there because some people are smoking and some are drinking and it's just not her type of fun. Micah seems upset by her being upset because he wants her to "live a little" and says that "all high school kids drink". I was really disappointed that it seemed he was trying to make her feel bad about not having a good time. No one should be forced to drink to have a good time. But Micah seemed to mature as the story went on and I grew to love him as a character. Also, this book features some incredible songs. Every chapter is the title of a song with the artist and I knew about 85% of the songs and it was so fun for me to look up the song and listen to it before starting the chapter. Music is a huge part of my life and I'm glad to see that Ms. Gadoury incorporated it in her book. A sweet Contemporary YA novel, Chantal Gadoury brings high school romance to life in The Songs in Our Hearts. The characters are easy to relate too and it shows real problems lots of teenagers often face during their High School years well. Once I started reading I couldn’t put it down! Thank you Chantal for giving me the opportunity to read this wonderful book! I received an e-copy of this book from the author in return for an honest review. This was a sweet contemporary book about high school romance. I enjoyed the way that the song titles were interwoven into the story and was pleasantly surprised to see the significance of them at an integral part of the book (view spoiler)[ when Charlie creates a CD playlist for Micah detailing the reasons why she chose those particular songs (hide spoiler)] . I enjoyed the characters for the most part but would ha I received an e-copy of this book from the author in return for an honest review. This was a sweet contemporary book about high school romance. I enjoyed the way that the song titles were interwoven into the story and was pleasantly surprised to see the significance of them at an integral part of the book (view spoiler)[ when Charlie creates a CD playlist for Micah detailing the reasons why she chose those particular songs (hide spoiler)] . I enjoyed the characters for the most part but would have liked to see a bit more character development, especially with Micah. I did appreciate some background information on his home life (view spoiler)[ the part where he asks to come over because his dad had been drinking (hide spoiler)] and I felt that part made me understand Micah as a character more. I would have loved to see a few more bits like that! I must say that I really enjoyed this book. It brought back many memories of when I was in high school. Any who… this book is about a girl named Charlie she has been disappointed before when one of her best friends betrayed her trust when she had a crush on a guy. So, when a new boy named Micah comes to school and she seen him at the lunch table she is quick to deny her crush that she has. Later, in English class she must do a school project with him. I loved that they made a movie instead of an I must say that I really enjoyed this book. It brought back many memories of when I was in high school. Any who… this book is about a girl named Charlie she has been disappointed before when one of her best friends betrayed her trust when she had a crush on a guy. So, when a new boy named Micah comes to school and she seen him at the lunch table she is quick to deny her crush that she has. Later, in English class she must do a school project with him. I loved that they made a movie instead of an essay. I really enjoyed they way that their romance started. I kept saying to my self just kiss her already so many times and when they finally did I was so happy for Charlie. I did manage to read this book in just a few hours because I was just to enthralled with it that I didn’t want to put it down. I must say that the play list for this book is amazing I thought that all the songs fit perfectly. Contemporary YA romances I love reading and this is just another one to add to the list. Reading this book made me love Chantal’s writing style and I can’t wait to read her other books. 'The songs in our hearts', what a beautiful name for a beautiful book. I am not a big romance-YA book, but this book was lovely! I enjoyed reading I very much and it seems like a perfect summer read! I definitely recommend it, it is a very easy read and it provides a lot of entertainment. It made me want a guy like Micah! Readers will fall in love with these characters and the story line. With a story like so many others, the author has done a perfect job on putting her own memorable twists in this story, making it different from all the others. This story will stick with you for a long time. I enjoyed reading it and I wish I could read it all over again, and again, and again. I will be doing a review of this book on my YouTube channel soon, and I am very excited! Although I do not read many romance novels I have to say I did enjoy 'The Songs In Our Hearts'. After reading so many dystopian books recently it was a refreshing break - a very easy yet enjoyable read. I loved Chantal's style of writing and also LOVED how each chapter was the name of a song - it's such a unique idea and also got me excited when it was a song I liked! 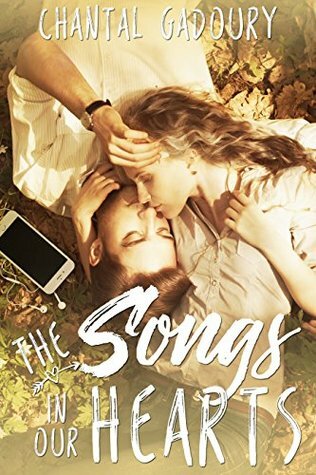 I thought the characters were relatable and loved the relationships between them, especially the relationship that Charlie had wi Although I do not read many romance novels I have to say I did enjoy 'The Songs In Our Hearts'. After reading so many dystopian books recently it was a refreshing break - a very easy yet enjoyable read. I thought the characters were relatable and loved the relationships between them, especially the relationship that Charlie had with her brother and her Dad. It was also nice that there was more to Micah then meets the eye. It took me a long time to get into this book. I read the second half in like Three days, but it was hard for me to pick up for the first half. I enjoy the storyline, I love that the romance is centered around an English Project, and the authors analysis of Frankenstein has encouraged me a little more to read it. I do like the characters and the nod towards “don’t judge a book by the cover” within the characters. I did not like the bonfire scene, to me it felt rushed and thrown in to make somethi It took me a long time to get into this book. I read the second half in like Three days, but it was hard for me to pick up for the first half. I enjoy the storyline, I love that the romance is centered around an English Project, and the authors analysis of Frankenstein has encouraged me a little more to read it. I do like the characters and the nod towards “don’t judge a book by the cover” within the characters. I did not like the bonfire scene, to me it felt rushed and thrown in to make something else work. And, as intended, I hated Samantha. I received and ARC from the author in exchange for an honest review! I absolutely adored this book! Despite the huge pile of reading I had to do for school, I decided to read this instead and I knocked it out in two days because I didn't want to put it down! Something I love about this book is the characters. I find that with teen romance novels, the main female character is always insecure about her physical appearance or something silly but Charlie was unforgivably herself. And Micah was such a I received and ARC from the author in exchange for an honest review! I absolutely adored this book! Despite the huge pile of reading I had to do for school, I decided to read this instead and I knocked it out in two days because I didn't want to put it down! Something I love about this book is the characters. I find that with teen romance novels, the main female character is always insecure about her physical appearance or something silly but Charlie was unforgivably herself. And Micah was such a fun foil character. It left me feeling happy. Even with the predictable ending of a romance, it was fresh and I was never bored. Actually, I was so hooked that every time I tried to stop reading, I continued on because I wanted to know what happened next. I really love to see how a story unfolds even if I know the ending. Oh, and there's lots of music mentioned which is awesome! So good 👍 Set in highschool and occasionally immature, I still ended the book with a big ol' smile on my face. A nice, short, romantic, teen slow burn🔥You won't regret reading about Charlie and Micah! Thank you Chantal for sending me a copy of the book. That being said, it didn't, in any way, affect my criticism of the book. All my opinions are mine and mine alone. Starting off, I think this is just your generic contemporary-romance wherein the girl protagonist had an issue with her past friend (or best friend) and became to self-conscious. Then, a guy came in, and she's afraid that he'll hurt her so she just took it to herself to hide the fact that she liked him. ♥ The s Thank you Chantal for sending me a copy of the book. That being said, it didn't, in any way, affect my criticism of the book. All my opinions are mine and mine alone. ♥ The simplicity of the story made it very realistic. ♥ The story itself is relatable, but the characters are easy to sympathize with as well. ♥ Characters has a nice dynamic to them. ♥ The pacing of the book was nice and the continuity of each chapter is amazing. ♥ The songs are astoundingly good. I just hope I could listen to them while reading, but I am not that type of reader. This book might just become one of my favorite contemporary books of all time. It was SO GOOD. I planned on reading this book over the course of three days or so, but last night I started it and before I knew it I had finished it. The story follows Charlie Blake, a teenager in high school who doesn’t fit in with the popular girls, specifically a girl named Samantha. She and Samantha were once friends, but Samantha went behind her back and sabotaged her, and constantly tries to ruin Charlie’s life. Samantha starts a rumor that Charlie has a crush on the new kid, Micah, and once the two are paired up for an English project, Charlie and Micah are forced to become at least friends. This is a small town story with no insta-love. When reading I was able to see Charlie and Micah’s friendship grow and watch them learn to open up and trust each other. Family is another important theme as Charlie is close with her older brother. Their dynamic felt authentic and their banter was hilarious, just as how siblings act in real life. Each chapter of this book has a song that accompanies it, and it was such a cool experience to listen to the song that went with each chapter. Not only was I reading a great book, but I was also learning about new music as well, which is one of the main things that connects Charlie and Miach in the first place. This book was really sweet and cute! It definitely is a romance story, but a very good one. I know many people don't like contemporary books, but I love them so much. It's nice to read a good old romance between two people. It is after all the most normal thing on this earth, but every person experiences it differently. I really liked the pace of the story, it felt very natural to me and not at all rushed or too slow or anything. It felt realistic. Another thing I also really enjoyed was the conn This book was really sweet and cute! It definitely is a romance story, but a very good one. I know many people don't like contemporary books, but I love them so much. It's nice to read a good old romance between two people. It is after all the most normal thing on this earth, but every person experiences it differently. I really liked the pace of the story, it felt very natural to me and not at all rushed or too slow or anything. It felt realistic. Another thing I also really enjoyed was the connection between the protagonist and the love interest, through music. Music plays a big part in this book, which I, as a music lover myself, find very refreshing and interesting. Last but not least, I absolutely LOVE this author's writing style. It is very beautiful and the story is very well written. This book should definitely be read by every contemporary lover! I'm sure my opinion of my own book is a bit biased, but I think this novel will delight readers. Fans who enjoy Jenny Han, Sarah Dessen, or Jennifer E. Smith, should enjoy this story about Charlie, a young high school girl who has a crush on a very different sort of boy - Micah Jacobs. Their story is one of self-growth and young love. These characters are so personal to me. I hope readers enjoy their journey in "The Songs in Our Hearts!"